I have recently realized that I apparently have a huge problem: I find these authors that have books that sound so wonderful I go get their books and add them to my toppling TBR pile and I then cannot find the time to actually read them . I know, many of you fellow bookworms probably have the same problem. When I decided to read Brandy Purdy's newest novel as part of her blog tour I realized I have almost all of her previous novels on my shelves, ready to be loved and devoured, but that I had not yet read even one of them. And, per the usual, I am now kicking myself that I took this long to read her books!! The Ripper's Wife pulled me in from page one. Set up for most of the novel as Florie Maybrick telling her side of the story - from her meeting and falling in love with James Maybrick to the downward spiral of their marriage and her discovery that James was Jack the Ripper all the way to her final sad and lonely days - and interspersed in the middle of the novel with James Maybrick's diary entries detailing his violent and twisted alternate life as one of the world's most infamous killers, the novel never had a dull moment for me. The reader knows from the beginning what the outcome of Florie's life will be and the horrid turn her life will take and this caused a delicious sense of foreboding to hang over the whole story, even the seemingly fairytale beginnings of the Maybrick's early marriage. It doesn't take long for Florie's life to spin out of control and while Florie makes some very bad mistakes over the years that had me yelling at her to grow up and make the right decisions for her and her children it was heartbreaking to watch the vicious beatings she took at the hands of this supposedly loving husband and the eventual jail time she served for a murder she didn't commit. I am not completely sure how much of this novel is based in fact (and this would be one of my only complaints about The Ripper's Wife...no author notes at the back of the book explaining what is fact and what is fiction) but the life Florie lived within the pages of The Ripper's Wife is absolutely heartbreaking. Ms. Purdy does not hold back from detailing the horrible things Florie went through and the descriptions are quite intense. James Maybrick's diary entries are likewise vivid and descriptive and I felt like I was watching those poor women be stalked and torn apart by this sick and twist man. For some it might be hard to read these passages but I would ask why someone would think to read a novel about Jack the Ripper and shy away from then reading the bloody details....the actions of this killer were violent and horrible and Brandy Purdy perfectly brings it all to life. Having now finished the novel and looking back at the story as a whole, I feel Ms. Purdy did a remarkable job at giving life to these characters, each one of which is flawed and sympathetic in their own way (even James, believe it or not!). Her descriptive power is superb and I felt completely immersed in the story as it unfolded. If you are a fan of historical fiction and are able to stomach what by right should be a graphic and depraved story given the subject matter, I would highly recommend The Ripper's Wife. I love it! The color's are beautiful and fitting and the woman fits the descriptions of Florie perfectly. Seeing her reading the diary and looking back at the reader with her mouth set like she had read something horrible gives you that feeling of confidence between the reader and Florie. I can't think of any changes I would have preferred to see. Thank you to Amy at Historical Fiction Virtual Book Tours for providing me with a free copy of The Ripper's Wife in exchange for an honest review! Make sure to continue below for more information about the book, the author and how to enter to win a copy of your very own! For a chance to win a paperback copy of The Ripper's Wife (U.S. only!) leave a comment below letting me know if you have read any of Brandy Purdy's novels and, if you have, which is your favorite. Be sure to leave your email address (no email address/no entry!). For extra entries share this review/giveaway online and leave a separate comment with a link to where you shared. That's it! I'll pick a winner on November 18th and the winner will have 48 hours to respond to my email before I have to pick another winner. Good luck everyone! Thank you for a great review Colleen, I'm so glad you enjoyed my book. I hope you enjoy the others too when you get a chance to read them. I have the exact same problem, books are always piling up, I love them and can't stop buying them, even though I can't find time to read them all. Wow, thank you for stopping by the blog, Brandy!! I'm so honored and I am sure I will love the other books as much as I did this one...I love your writing style! I have not yet read any of the books. I haven't yet read any of her books, but I have one on the TBR. I just read the post that is a "sort-of" author's notes on a more recent blog entry. That has made me really anxious to read this novel. Thanks for the giveaway. I have read several of Ms. Purdy's books; 'The Queen's Pleasure' is my favorite but I have enjoyed them all. 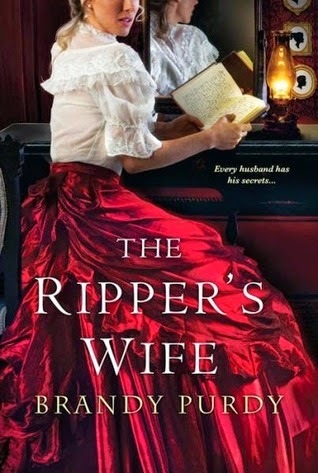 I can't wait to read 'The Ripper's Wife'! What a unique take on such a fascinating period of time. I still shudder to think of the fear endured by the people during that time. Thanks everyone for commenting!!! The winner picked using a random number generator is....Shannon Leigh! Congratulations Shannon and I will send you an email in just a few minutes. You will have 48 hours to respond before I have to pick another winner. Everyone make sure to check out my review and giveaway of The Tiger Queens that posted today and enter to win that book as well. It is an awesome book! Well, I never heard back from Shannon so I need to pick another winner! Using a random number generator our new winner is....Raquel Muniz!!! Congratulations Raquel, I will be emailing you in just a second and you will have 48 hours to respond to my email before I have to pick another winner!